IMO the perfect scone is tender and not sickeningly sweet. They are one of my favorite baked goods. I am slightly partial to cream scones, but also enjoy ones that use buttermilk or yogurt. They key of course is not over-stirring them once liquid is combined with the dry ingredients. Like biscuits or pie crust, the less handling, the better! I offered to bake scones for a friend’s birthday this week and had a craving for cinnamon and maple. I combined those two flavors for what I believe is one of the best scones I’ve made yet. If you are one of those folks that believe scones should be sickeningly sweet like a giant cookie, move along. These are not your kind of scone. If these are a bit too sweet for your liking, leave off the glaze. They’ll still be delicious! Mix all dry ingredients together. Use a pastry cutter to incorporate butter until mixture looks like small peas. It is fine to have a few larger pieces of butter. You can work with it as much as you want at this stage. Add cinnamon chips and stir in with a fork. Measure heavy cream into liquid measuring cup. Stir egg and vanilla into the cream using a fork to incorporate the egg. Pour liquid into dry ingredients and carefully mix together until it comes together. A spatula works great. Turn dough onto a cookie sheet covered with parchment paper or a baking mat. Press into a 8-inch disc. Add a bit more cream to measuring cup and brush the top of the dough with a thin layer of heave cream. Lightly sprinkle the top with a pinch or two of sugar. Use a pizza cutter to cut into 8 wedges. Bake in 400 degree oven for 20 minutes or until golden around the edges. In a separate bowl combine 1/2 cup confectioners’ sugar, 1/2 teaspoon vanilla, 2-3 tablespoons maple syrup. Stir until smooth. Add more syrup or sugar to alter consistency. Drizzle over scones. Scones are always best served warm. You can keep these in an air tight container for a day or two. Just warm them for 30 seconds in the microwave or place them in a warm over for 5-10 minutes. You can also wrap them individually and freeze some for later. Include a Hedgehog at Tea! Thank you Morgan for this delightful recipe! If you’ve never visited mygrandmasrecipebook.com, you are in for a treat – or two! Morgan chronicles some great old-fashioned recipes including this one she sent exclusively for my blog! This is a very nice, traditional Australian recipe from the 70’s and 80’s that is often served for afternoon tea or parties. I remember my grandmother and mother both making this for children’s birthday parties or just a special treat. Putting the biscuits/cookies in a zip-loc plastic bag, crush the biscuits with a rolling pin or other heavy tool until they are small pieces. Melt the butter in a large bowl. Add the cocoa powder and stir until mixed. Add the other ingredients and the biscuits, and then stir to combine. Line a lamington tin (13” x 9” slice tin) with baking or greaseproof paper and spread the mixture into a thick layer. Refrigerate for 1 hour; before the slice is set too firmly, cut into squares. It is possible to substitute walnuts or almonds for the pecans. This is an unbaked recipe using eggs, so it is not advised for young children or pregnant women. Please practice good egg safety. 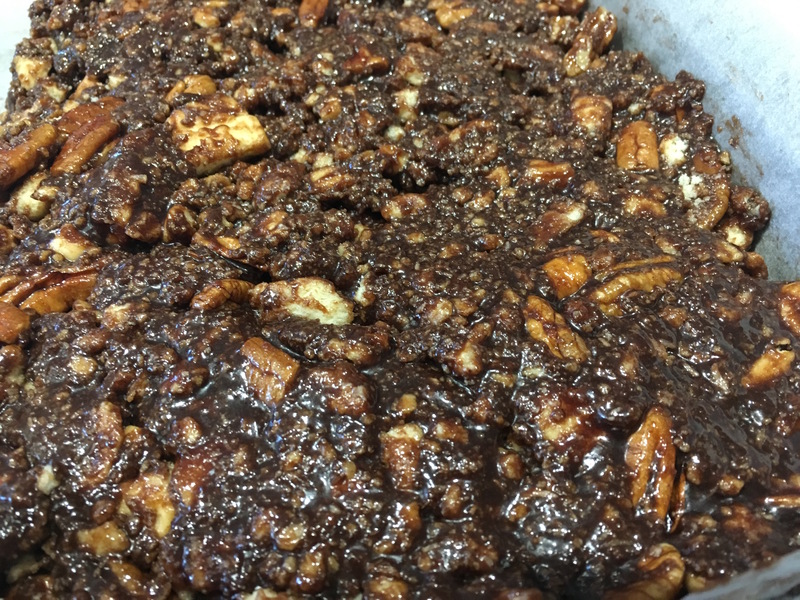 Note from Brad: This no-bake dessert really hits the spot when you need a chocolate fix. And since it uses cocoa powder and nuts, it’s a bit healthier than other sweets! Give it a try and let me know what you think! Better yet, make it at home and tag me (@GourmandBrad) and Morgan (@grandmasbook) on a photo of your concoction in Twitter. I know this is a dramatic title. Maybe I’ve been reading too much Huff Post lately! But seriously, these are the apps I rely heavily on while in my kitchen. And as always, feel free to chime in and share what apps you find indispensable to cooking. What would I do without my smartphone camera? I use it to take pictures while I’m cooking which is handy. But more importantly, I take photos of recipes in magazines whenever I am in a waiting room! Remember the days when you were in the doctor’s office and found a recipe you wanted to try, so you had to either write it down on a scrap of paper or secretly tear it out of the magazine? (OK, I never did that!) Now I snap a photo and refer back to it when shopping or ready to cook. This was the first cooking app I ever used and it continues to be a mainstay. I’ve compiled many of my favorites in the recipe box feature. I like the categories such as “picnic ideas,” “main course salads,” or “Mexican tonight.” Photos, reviews, ratings, and step by step instructions make this a user-friendly resource that is loaded with recipes. Epicurious features a suite of mobile applications, including one for your smart Samsung fridge! I’m not going to recommend any specific grocery store since I have no idea what’s available in your area. I will tell you however, that if your favorite store has a useful app, download it! I really like the Wegmen’s app. I can add all my ingredients to the list and it will organize them by aisle for faster shopping. It gives me a total of what I’m about to spend. Other cool features include tons of recipes and even a prescription refill option. You might already have a favorite coupon app since there are a few out there. This one from coupons.com allows you to register your loyalty card, add applicable coupons to your account, and redeem them right at checkout. It takes some time to scroll through the available coupons whenever you go shopping, but saves you the trouble of clipping and storing paper coupons. Since I love to cook, it helps keep costs down on my grocery bills. If you like grilling, then the Weber’s Grill app is one to consider. Besides a slew of grilling recipes, it serves up grilling techniques and a handy timer. It has a grocery list feature, but since I use my grocery store app, I haven’t really taken advantage of that section. This is more of a product than an app, but it’s the app that makes it so cool. Weber’s iGrill products mean you are no longer tethered to the grill or oven when cooking. The app on your phone keeps you updated on internal temps. If like me you start talking to your guests in the kitchen while your meat is cooking out on the grill, then this is a lifesaver. If you’re a baker, this app is for you. Scale recipes up or down like a pro. Convert between metric and non metric measurement. Have you ever been up to your elbows in a recipe only to find you are missing a critical ingredient? I sure have! Substitutions is a handy app to have when you need to find a way to make a recipe work when running to the grocery store that minute is not an option. Even better, the app helps you find substitutions for ingredients that cause allergic reactions. Brilliant! What’s on your smartphone that makes home cooking easier? I’d love to know! 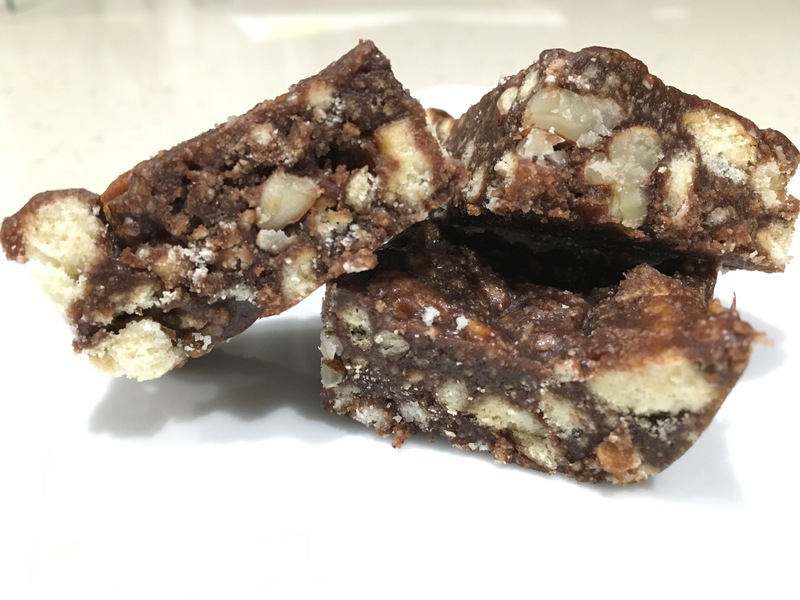 I love retro foods, so when I stumbled across Mary’s delightful website Old Fashioned Recipes, chock full of oldies, but goodies, I hit the jackpot! She provides recipes for award-winning chocolate cake, creamy scalloped potatoes, chicken pot pie, and much more! Mary was kind enough to include one of my favorite family recipes for my grandmother’s banana cake. It’s nice to know gram’s cake recipe found an audience among people who love simple, yet delicious home cooking. If you’d like the recipe to Banana Cake with Penuche Frosting or to browse similar fare like your Gramma used to make, then be sure to visit her site! I participate in a couple of Facebook groups for self-proclaimed home chefs. I really enjoy seeing what other home cooks are putting on the dinner table. To be honest, most of them put me to shame! One of my favorite groups is The Home Chef’s hangout. The members are very positive and encouraging. I asked them to be my research sample for this blog post and they responded with gusto. My question to them was: What are your three go-to pantry items you cannot live without as a home cook? As you can imagine, it was not easy for many to keep their list down to three. 50 home cooks participated. These four items were leaders by a wide margin: olive oil, garlic, pasta, and tomato products. I am beginning to confirm my suspicions that by and large, the group prefers Italian cuisine! It makes sense when you consider how many dishes you incorporate at least one of these components into. I start nearly every savory dish with a splash of olive oil! Another day I will highlight a few pantry items I think you should have to really enhance your home cooked meals! Stay tuned. And, feel free to add your three favorite must-have pantry items in the comments below!